Overly dry air can make your skin and respiratory problems flare up, from asthma and allergies to eczema and acne. If your home air is too dry, it could cause bloody noses, chapped lips, and itchy skin. Your respiratory system is lined with moist membranes in your nose and throat that prevent bacteria, viruses, dirt, and dust from getting into your lungs. If they are dry, they won’t keep particles out effectively, making you more vulnerable to sickness. In addition, dry air increases static electricity, which produces painful shocks and zaps when you walk around on the carpet or touch metal surfaces. It will also make your hair more difficult to maintain and cause your clothes to stick to you uncomfortably. Dry air will pull moisture from hardwood floors, furniture, and even the walls, doors, and general frame of your home, making it contract and shift. As the frame shifts, doors may be hard to open and close, or gaps may form between the ceiling, walls, windows, and door frames. Books, artwork, and even the paint or wallpaper on your walls can get brittle, warped, or wrinkled in dry air. If you have musical instruments, they may lose their shape and tune. Humid air feels warmer, so moderate levels of humidity can allow you to set the thermostat lower and give your heating system a break. That way, you can live comfortably and save money on your heating bill and maintenance. But be careful: excess moisture may cause mold, bacteria, and mildew growth in poorly ventilated areas of your home. You can keep an ideal, comfortable humidity level between 40 and 60 percent with a whole home humidifier. WestAIR Heating & Cooling offers whole house humidifiers that will keep every room of your home comfortable, even in the dry winter. Our humidifiers will automatically work with your HVAC system to distribute moisture throughout your home’s entire duct system. We offer programmable thermostats that come with a built-in humidity sensor so you can test and regulate home humidity and avoid going overboard. Contact us to learn more about your heating and indoor air quality options. Winter is here, and so is crisp Minnesota air. As the temperatures drop, so does humidity levels which can cause poor indoor air quality in our homes and negative effects on the body’s immune system. If you’re concerned about your health and comfort this season, consider using a humidifier during the cooler months. Dry air dries out your sinuses, nose and throat making it harder for your body to fight off unwanted germs. A humidifier increases humidity levels in your home, helping you breathe easier. Small portable humidifers work well for one room, or consider installing a whole house humidifier which works in conjunction with your HVAC system. Whole house humidifers also benefit allergy and asthma sufferers by keeping the throat, lungs and sinuses well lubricated. Whole home humidifiers also regulate indoor air quality to ensure the proper balance of humidity in your home. If you or someone you know suffers from eczema or other skin conditions, you know first-hand how dry air affects them. Moisturizing the skin helps, in addition to maintaining the proper humidity levels in your home. Have you ever woken up in the morning with a dry, sore throat? Your throat, chest, nose and mouth become progressively drier during the winter months. Maintaining the proper humidity levels in your home can help manage the air, giving you a better night’s sleep. During the Upper Midwest winter months the air inside of our homes tends to get etremely dry. There are simple signs such as dry skin, dry nose, and dandruff. A humidifier is the best solution to combat dry winter air in your home. Portable humidifiers are like a piece of furniture taking up extra space in various rooms. They also involve the inconvience of always having to be refilled with more and more water. Even with this type of humidifier, you may still experience dry skin and dry air at times. Coming home to a dry house is just as unpleasant as coming home to a cold house after a long day at work or a weekend away. A whole house humidifer is the number one solution to all of the discomforts and hassles of dry winter air. No more refilling the humidifier with water and no extra furnitiure in rooms throughout the house. Our whole house humidifiers involve a simple installation and will deliver healthier air to you and your family. If you would like to read more information about Aprilaire humidifiers please visit our website via the following link: WestAIR Whole House Humifidiers. Give us a call today for a free estimate on a whole house humidifier designed just for your home. Continue to change your air filter monthly for a seemless transition into the cooling season. Ensure registers are free of dust and debris by vacuuming out vents in each room of your home. Make an appointment to have a WestAIR professional perform a thorough duct-cleaning to ensure proper air flow through your home. Ensure CO detectors are functioning properly in the home. Change batteries as needed. Have you been using your whole-home humidifier system this winter? Consider turning down the humidifier or turn it off entirely in the spring and summer months. Now is a great time to think about the way your furnace performed this past winter. Get a jump-start on replacing your furnace now before the next cold season begins. Also, take a minute to think about your air conditioning unit and insure it’s ready to run this summer. For all your heating & cooling needs, contact WestAIR Heating & Cooling at 763-498-8071. It’s Time to Change Your Air Filter! A dirty filter slows down the air flow and in turn makes your system run harder to keep your home cool (or warm in the winter months). This not only wastes energy, but it also drives up your energy bill. Changing your filter can also increase the life of your HVAC system for similar reasons. If the system doesn’t have to work so hard to push air through, it can run for a lot longer. A clean filter can also prevent dust and buildup from clogging your system, which can lead to expensive repairs. But most importantly, a clean filter helps to keep you and your family healthy. By changing your HVAC or furnace filter on a regular basis you help improve your home’s indoor air quality by eliminating dust, mold, pollen, spores, and other pesky contaminants that can worsen allergies and asthma or potentially cause sickness. If you own a home, cabin or apartment without built in duct work; air conditioning is still not out of reach. Lucky for you WestAIR installs and services ductless air conditioners. The installation process is easy and there is no duct work needed. One great advantage is that with a ductless AC there is a zoning capability that allows for only occupied spaces to be conditioned instead of the entire house. Multiple areas may also be conditioned with mini splits or dual, tri and quad zones. Not sure if a ductless system is right for your home? Call WestAIR Heating and Cooling today for a free estimate. With winter finally set in you or other family members may be experiencing health symptoms such as: dry or sore throat, dry skin and runny noses. These symptoms sometimes lead to colds or the flu. You may be wondering why does this always happen during the winter months here in Minnesota? The answer is dry air! During the winter the air is much colder than it is in the summer. Because of this it is not able to hold as much moisture or any at all. All of the moisture has been sucked out of the air and froze. This happens in our homes because the air is trapped inside. The amount of air flow is very low since we don’t open our windows during the winter. The solution to all these dry air problems is a humidifier. 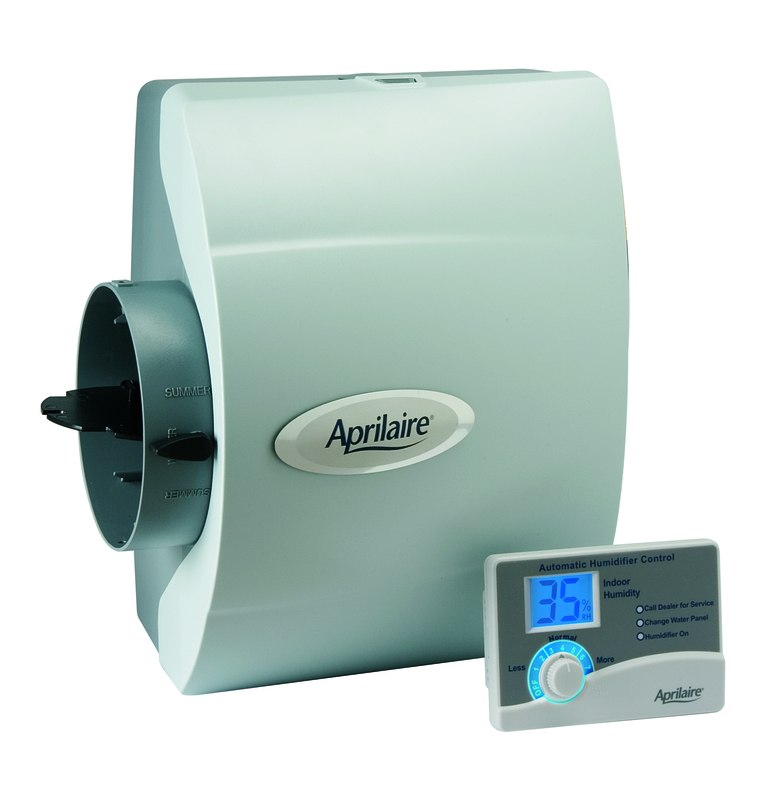 An inline whole house Aprilaire humidifier helps maintain the moisture levels within your home. Thus creating a comfortable and healthy atmosphere for you and your family. At WestAIR heating we proudly install Aprilaire whole house humidifiers. This is the better option over a portable humidifier. Why? Whole house humidifiers have the ability to automatically control your entire homes humidity levels 24/7 with a continuous automatic digital control, annual minimal maintenance required and energy savings. Specials are available if you schedule your installation with other furnace or Indoor Air Quality services. Call us today to schedule a simple installation of an energy saving Whole-Home Humidifier.